On Wednesday the 25th of May I went to a wine maker's dinner. There were 8 courses and 7 wines. Phew, hard work but someone's got to do it! To start the evening off, we had a glass of Semillon Sauvignon Blanc. Ok, the first two courses were queen bouche and eggplant caviar, they were served with a Sauvignon Blanc. 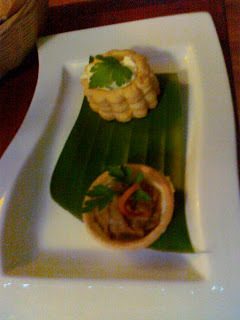 The queen bouche comprised a pastry casing filled with capsicum marmalade topped with grilled goat cheese. The rich sweetness of the capsicum marmalade was well combined with the creamy, slightly salty goat cheese. The eggplant caviar was a delicious mix of eggplant, garlic, cumin and olives - it had a lovely smooth texture. The next two courses were prawn tartare and spanish mushroom. They were served with the Rose and the Pinot Grigio. The prawn tartare was marinated in lime juice, coconut milk, red onion and green chilli. It was tender and slightly spicy and went very well with the Rose. 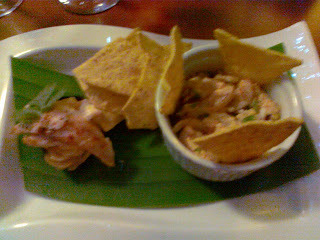 Corn chips and prawn tartare = winner combination of texture and flavour. The spanish mushroom was really delicious, there were seared red emperor slices atop a field mushroom with chorizo cream (and a bit of mash!). The flavours in the dish went really well with the pinot grigio. We all agreed that the Pinot Grigio would stand alone as a quaffing wine too! 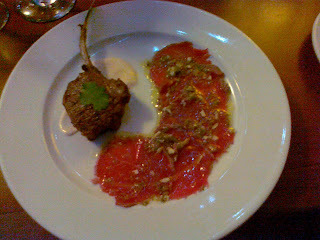 Courses 5 and 6 were an eye fillet carpaccio served with Temperanillo and cajun lamb cutlet served with a Cabernet Sauvignon. The carpaccio had black pepper and capers with it and a generous amount of good olive oil. The slices were wafer thin and wonderfully tender. The Temperanillo was a lovely surprise, fruity and light, another very good quaffing wine! The cajun lamb fillet was absolutely delightful, tender and juicy and lightly coated in a delicious mix of spices. It came with a yoghurt sweet chilli sauce on the side. Course 7 was dessert! 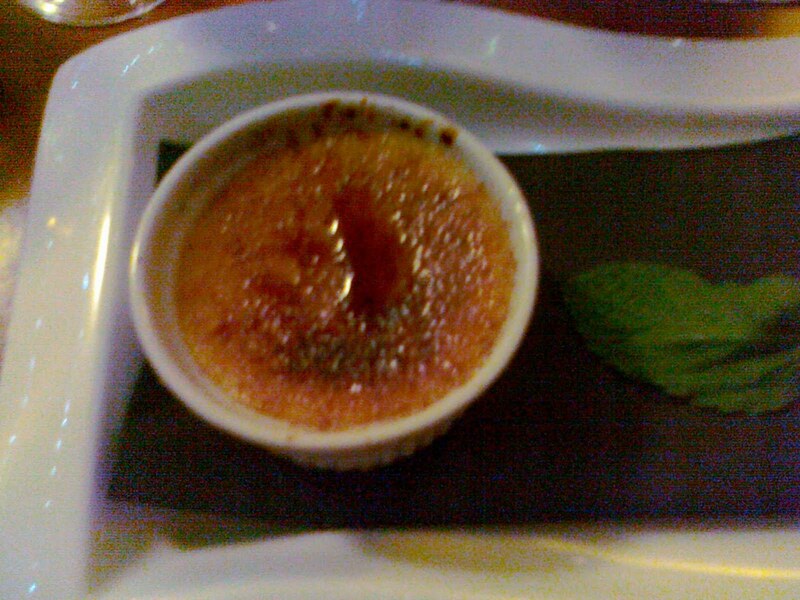 A creme brulee topped with Grand Marnier, served with a Traminer. The brulee was gorgeously silky and the wine had delicious fruit, they went really well together. The last course was the cheese course, served with Shiraz. Tim's/Ten Litchfield, whatever it is called! even more April and May!